Tamara Madison is a correspondent for Lucire. I am not one who strays away from simplicity. In fact, I immensely appreciate it. Even in my somewhat elaborate and typically bold coloured daily (fashion) uniform there are occasions when soft hues speak to me. The tone might be haute couture whispers in lustrous finishes and sheer overlays, but they are appreciated. Intricate details can sometimes be frightfully overlooked when they are in the form of pale textures, fine seams, or unconventional silhouettes. But, it doesn’t mean that those details are without impact or are less provocative. Those were my immediate thoughts upon first glance at designer Timi Hayek’s garments. My first encounter of her work was the viewing of three pieces. Many garments were like little minuets, the fabric danced with the model’s gait in each movement of tiers, and textures had rhythms of their own. My eyes were drawn to one dress in particular though—a ’60s-inspired dress silhouette with frothy coloured pleats descending as they were layered underneath. The Beirut-based fashion designer and illustrator captures a modern elegance and ease so aptly in her clothing, but without being too contrived. Her approach translates to somewhat a hybrid of the clothes themselves saying, ‘Now you see me!’ but in a far less conspicuous way. 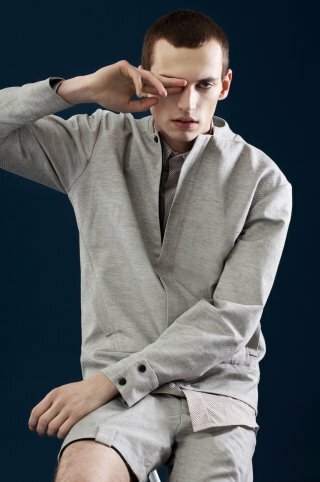 The clothing: pensive and thoughtfully understated with a minimalistic luxe quality. Hayek’s new eponymous label offers varied textures of high-quality and natural fabrics, like silk, and linen. The erudite Central Saint Martins alumna is no stranger to labour-intensive efforts with handmade fashion details, having worked internships at Alexander McQueen, Mary Katrantzou, and Marc Jacobs in Louis Vuitton, it helped fine tune her passion for creativity. In the menswear department whilst under tutelage at McQ for Alexander McQueen, Hayek created a T-shirt print. The print, one that she had worked on the longest, was inspired by metallic studio objects: safety pins, belts, and pull tabs, to name a few. The hand-drawn illustration was later sold in stores for a season, and consequently sold out. The road to Hayek’s current success began shortly after her studies, and her ability to start her own label came with the help of non-profit organization, Starch. Since then, she’s learned a mound of knowledge about business, and has very much grown as a designer in the process. And, just as any best friend who would share their favourite music playlist with you, the enthusiastic designer shared heaps of advice for aspiring designers. ‘Being able to see the bigger picture for my brand and set goals is very important … knowing how to sell is also a huge learning curve. It’s OK to make mistakes, which is something I took really hard in the beginning. I would say to anyone who feels in their gut that going on their own is the right thing to do, then they should do it. Deciding that is probably the hardest part, but once you’re past it, things take shape,’ Hayek stated. The customer wearing a Timi Hayek piece would indeed make a statement, yet the special treat for them is all in the details of the garment. Those elements are either embedded with textures or in the way the fabric takes shape of a certain draped silhouette. But her design process is not exactly traditional, as she drapes without having fabric mock-ups or toile—the working display is what results in being the finished one-off garment. ‘I basically buy the fabric that I like and I combine them with other fabrics or create textures. It’s like patchwork. I don’t make them with pattern cutting, there’s a lot of draping. I like to work that way, and that’s creatively how I go forward,’ Hayek said. In her spring–summer 2015 collection, called Viento y Tierra, she showed delicate and fanciful silhouettes, much like soft arias with thematic stage lighting. They were non-constraining pieces that were graceful, and with ladylike charm. Hayek’s new autumn–winter 2016 collection (which she is presently working on) promises to be a range that has a slight nod to menswear. ‘It’s more of a draped menswear. The AW16 collection is the closest to my everyday style that I’ve ever done. Previous collections have been more fluid, whereas this one is more practical,’ the designer said. The bulk of the current line can easily be described as fresh classics or resort comfort. It’s a line for the well-travelled modish woman who loves timeless design with a contemporary attitude adjustment. Pieces like the oversize rolled sleeve jacket can be worn with sleek separates or a casual day dress. ‘My collections are inspired by clothes I want to wear. There is a big focus on comfort and timeless shapes,’ Hayek said. Much of the influence in her work also comes from 19th-century and early 20th-century painters, like artist and costumer designer, Leon Bakst, as well as the painter Egon Schiele. The result is a range of apparel that’s tuned with polished touches, and a youthful confidence. There’s almost a necessity to have that free-spirited boost that she puts in her pieces, because otherwise you would feel somewhat sartorially passé. The fine pleated layers of fabrics, or even the juxtaposition in fabric choice balances out her collections. Smart blending of diverse contrasts seem to work incredibly well with Hayek’s design æsthetic and is an unequivocal signature within her work, whether shown in her boutique, or on the runway. The past several years have been rewarding for the emerging talent. Still doing studies, she won the Liberty Art Fabrics Award in 2010 for her winning lace print design inspired by La Dolce Vita character, Silvia. That print was sold in Liberty & Co. stores. Only time will tell which path Hayek’s brand will take, and there are bountiful options for the young designer. At the pace she’s going, the label will continue to flourish withstanding the volatile fashion reels of the industry, and successfully cross global borders. So, be sure to keep your eyes peeled.